Just one more day event once a rare 4-year: ITB’s Art Market will be held! This is the pride of the city of Bandung art scene is very awaited. Precisely Sunday, 10/10/10 (wow! truly unique date!) ITB’s Art Market will be held officially only 10 hours! The theme at the moment is: Something Forgotten. To be sure this time the art market held up “number 10” as an eye catching. Right! Because the art market this time is the 10th, located on Jl. Ganesha No. 10. And certainly will be officially opened by Minister of Culture and Tourism of Indonesia, Jero Wacik. Some citizens or immigrants in the city of Bandung is often asked: What is ITB Art Market? ITB Art Market as far as I know, is a showcase of expression of the student / student Faculty of Art and Design ITB. The whole campus area ITB (up to the road) are used as “stage art.” Any art that. ITB campus will be divided into several areas, which accommodate the art and its supporting activities. Like the bazaar of food, clothing and accessories, artworks, etc., from the supporters / sponsor.Pengunjung even, sometimes, are invited to interact directly with art activities there. And not just as spectators. One more characteristic of ITB is the Art Market, organizers always picked the topics that was warm all around us. Both the social, political, economic and cultural. Feels very subtle allusions to the circumstances that occurred, which wrapped with a high artistic taste. 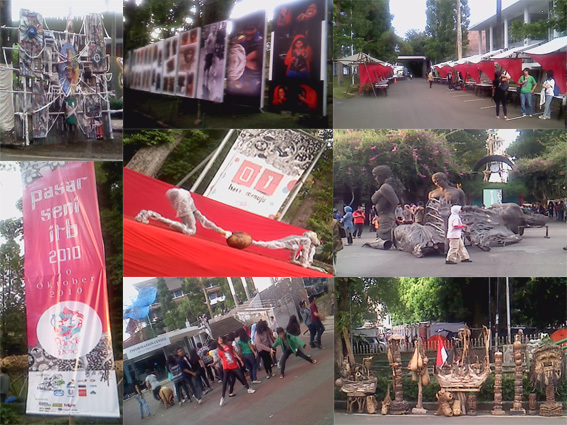 Well, according to ITB’s Art Marketat a glance which became one of tourist attraction in Bandung. Don’t you miss it! This entry was posted on Saturday, October 9th, 2010 at 7:53 pm	and tagged with Art Market, ITB, ITB's Art Market, Pasar Seni ITB and posted in History, Places, Souvenirs. You can follow any responses to this entry through the RSS 2.0 feed. « Hotel Sabang …. (still) Not in Sumatera! hi there…who are you?what’s ur name? Thank you for visiting my blog. I hope my blog has many benefits for you. BTW, what are you most like and dislike in my blog? Please be disclosed, to the progress of my blog as well. there are many tourists attractions to choose from, the only problem that we have is the money to spend to see most of them .